President of the Olympic Department of Russia (CBR) Alexander Zhukov called the home stadium of the football club «Spartak» beautiful building. About it he told reporters after the game 7-th round of the championship of Russia, which «Spartak» beat «torpedo» (3: 1). 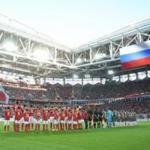 The last match was the first official game at the Opening of the Arena, which will host the meeting of the FIFA world Cup 2018. «It was nice to come here and watch football great quality. I am sure that with the advent of arenas such level in the Russian Federation interest in football will increase», — noted the head of the ROC.